A very fine and impressive, large antique George V English sterling silver presentation/champagne cup and cover; an addition to our presentation silverware collection This very fine George V sterling silver champagne/presentation cup has a plain circular bell shaped form to a circular domed spreading foot. The surface of this antique cup is plain and unembellished. 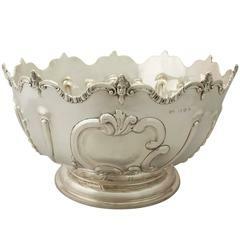 This versatile antique champagne/presentation cup retains the original hallmarked domed push fit cover surmounted with a very impressive fluted knopped finial. This cup is fitted with two impressive S scroll handles with plain thumbpieces and scrolling lower terminals. 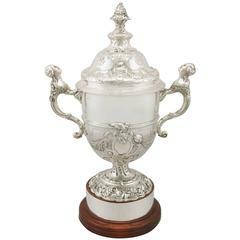 This George V cup is fitted to the original turned oak plinth, encircled with a vacant silver inscription band; the band may be engraved with a personal inscription if so desired. This cup is a substantial size and if required could be used as a wine/bottle cooler. 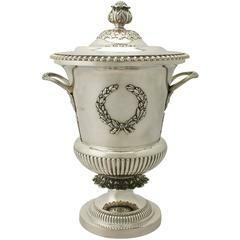 Condition This antique silver champagne cup and cover is an exceptional gauge of silver, very fine quality and in exceptional condition. 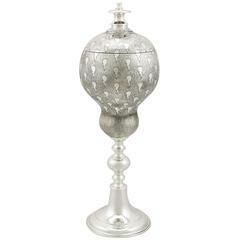 This impressive cup has been professionally polished and is in presentation condition. Full hallmarks struck to the underside of the cup, and part hallmarks to the cover are all very clear. Reflections in photographs may detract from the true representation of this fine example of antique silverware. Dimensions: Height to top of finial when on plinth 41.5cm/16.3" Height of cup to top of finial 32.5cm/12.75" Width across handles 34cm/13.4" Diameter of cup 22.5cm/8.8" Diameter of plinth 19.5cm/7.7”. Weight: 69 troy ounces/2146g Maker: William Comyns & Sons Ltd (Richard Comyns) Origin: London, England Date: 1935 Video: A video of this fine piece is available upon request Reflections in photographs may detract from the true representation of this fine example of antique silverware. 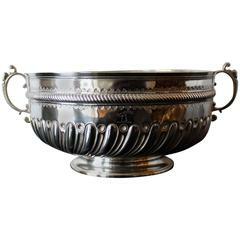 This antique presentation cup is very fine quality and in exceptional condition. 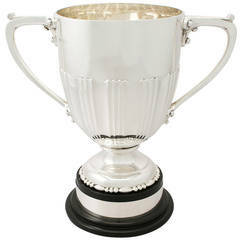 This impressive cup has been professionally polished and is in presentation condition. Full and part hallmarks are all very clear. 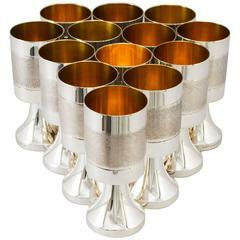 A set of 13 gilded and sterling silver champagne or wine cups. manufactured in1978 for Alton, Falköping, Sweden. approximate, 1700gr. stamped. 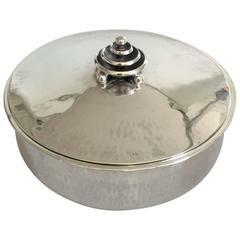 By Roger Williams Silver Co.
By Nathaniel Smith & Co.